What size litter can I expect from my ferret? The average litter should be around six to eight kits so, bearing this in mind, it would probably be worth having just one litter to start with. Believe me, finding good working homes for surplus ferrets isn’t that easy! 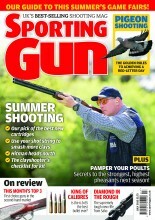 Maybe Sporting Gun should start a column in the monthly Shop Front section? Sometimes my jills have large litters and that’s something I wish could be avoided because the strains of labour really do knock the mothers for six. If I had a say in it, each litter would be small in number. If you are still keen on breeding then choose a sire that’s an equally good worker to your jill; make sure you see the hob in action and don’t make the mistake of picking a suitor by its colour – far too many folk do so and forget all about the original purpose of breeding – and that’s to get a litter of working, hunting, ferrets. A rabbit couldn’t care less about the colour of the killer chasing him (except for the brightness of its teeth perhaps) so put worker to worker when planning a family.